This afternoon’s higher than expected US Unemployment numbers which came in at 480,000 against a forecast f 461,000, have triggered further selling in both the global equity and forex markets, with commodities also suffering as a result. 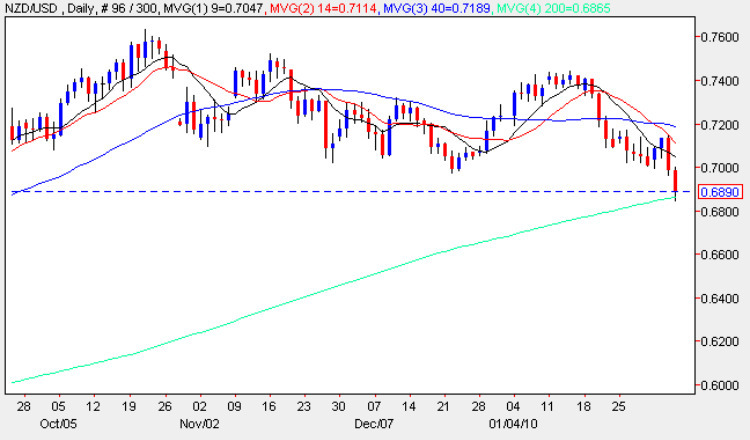 In late afternoon trading both gold price and crude oil were sharply lower, breaching various key technical levels as a result, mirroring the FTSE100 and DOW 30 which were also marked lower as a result. On the forex markets the two biggest losers were the Aussie dollar and the New Zealand dollar, both of which have been under pressure since the turn of the year, as speculators bale out of the carry trade and panic sell the currencies as a result. In binary trading today we saw the NZD/USD currency pair break below the key 0.70 level, and as s result now offers excellent longer term trading opportunities for binary betting on the short side of the market. With strong potential resistance now above, we have a deep and sustained areas of price congestion, which should prevent any short term pullback from gathering momentum. My suggestion is to therefore look for no touch and barrier trades moving forward based on this technical break.